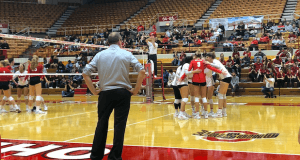 The Ohio State women’s volleyball team had a double dose of the Maryland Terrapins this week – but the second tasted much sweeter than the first. 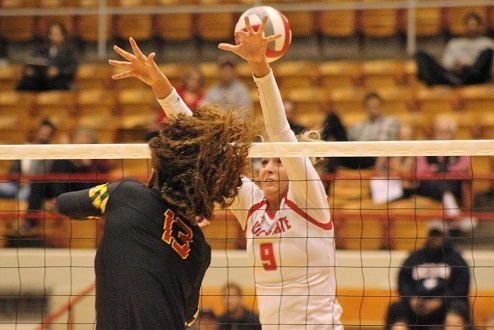 The Buckeyes swept Maryland at St. John Arena on Friday (25-19, 25-16, 25-16). With the win on their side, OSU now stands at 15-9 overall on the season and 5-7 in Big Ten play. The first matchup between the teams this week gave a much different result. 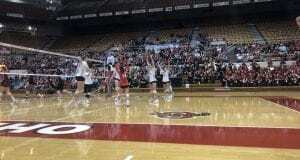 When the Buckeyes travelled to Maryland on Wednesday, it was the Terrapins who were celebrating the win after a grinding five-set fight. OSU sophomore setter Taylor Hughes said the main difference between the two matches was her team’s mentality. The Buckeyes were on top from the beginning in the first set. Junior outside hitter Luisa Schirmer fueled OSU’s offense by swinging away for six of the team’s 14 kills recorded in the opening set. 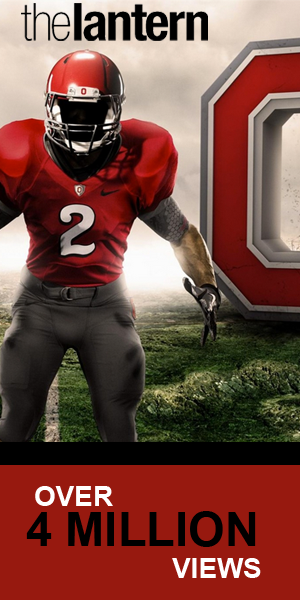 OSU wasn’t easing off in the second either. They were able to continuously counter back after mistakes with kills and points of their own. 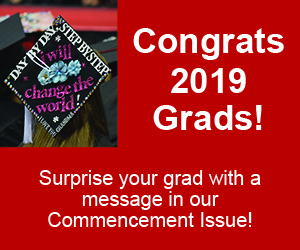 It was again Schirmer who was steady at the service line and allowed the Buckeyes to go on a five-point run mid-set and pull away from the Terrapins. In the third set, sophomore outside hitter Audra Appold racked up impressive hitting numbers, posting seven kills of her own. 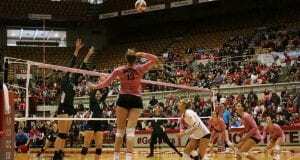 OSU maintained a comfortable lead late in the set, allowing the Buckeyes to cruise to the match victory. Schirmer said Friday served as satisfying redemption from earlier in the week, as well as a confidence booster to the team’s mindset. “It’s great when a game like that (on Wednesday) was so close, and we feel like we had it – and then to come back and solidify the fact that we should’ve had it,” she said. OSU shut down the Terrapin’s offense, limiting them to a mere .020 attacking percentage. 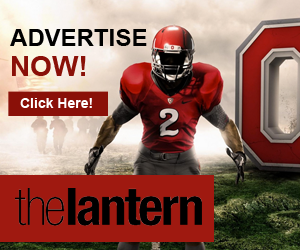 The Buckeyes also more than doubled Maryland’s blocking efforts — 10 for the Buckeyes and five for the Terrapins. 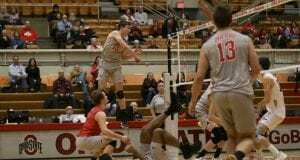 Appold was the night’s attacking and dig leader with a double-double, 16 kills and 12 digs respectively. Hughes contributed 38 assists and combined for five blocks, barely topped by senior middle blocker Taylor Sandbothe with seven rejections. All six of OSU’s hitters ended the match with healthy attacking averages over .220. Hughes said the offense’s skills were pivotal to the win, also giving credit to the back row’s contributions. Schirmer commended Hughes for spreading out the team’s offense and giving everyone a chance to do their part. “We distributed the ball really well, and every person made big plays when it mattered. It was a team effort,” she said. 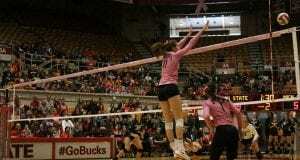 OSU will see play again on Wednesday when they defend their home court against the Wisconsin Badgers at 8 p.m.